We offer the only the best and most up to date designer frames. Frame styles are updated as often as every other month depending on the manufactures policy. Our frames are all "Top of the Line" quality materials. Outdated frames are returned to the vendor. We do not sell seconds or closeout frames. All frames offered must meet Harrity Optical exacting standards. What ever your needs we can be of service. All lens types are offered at Harrity Optical such as anti-reflective, progressive, computer optimized, transitions, Polaroid lenses or any custom designed lens. We will meet your individual requirements and we will place the lenses in the best quality frames available on the market today. Contacts lenses from Harrity Optical are premium lenses with the latest technology in the industry. A full range of technology such as toric lenses for astigmatism and multifocal lenses are available. We can supply your contacts from virtually any manufacture. Many common prescription lenses are available on site form emergency needs. Eye exams to determine your correction requirements are by Dr. Michael Murphy, O.D. Exams are by appointment only so please call at 716 947-9992 to schedule an exam. Medical exams are also available by appointment. Most insurance plans are accepted, however reasonable rates are available for patients without coverage. If your frames need adjustment we will try to help if possible. Drop by to see if we can be of assistance. Most, but not all, adjustments are provided as a customer service. Free consultation on hearing aids are available. All makes and models of digital hearings aids are offered by Harrity Optical. Our goal is to find the right technology and style for your hearing requirements. We fit all kinds of hearing aids from completely in the ear canal to behind the ear styles. 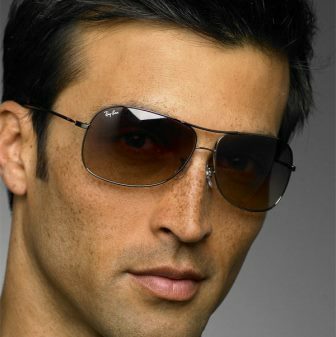 Harrity Optical carries an outstanding line of designer sunglasses including Ray Ban, Vogue, and Nautica. We also can create sunglasses to your exact needs with custom frames and lenses. Photo Gallery | Services | Copyright © 2013 Harrity Optical, Inc. All Rights Reserved.